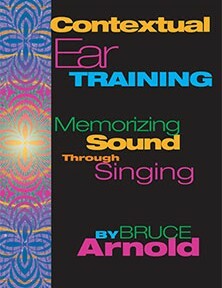 Contextual Ear Training is one of our most popular Ear Training Singing Books. If you are just getting started with the Bruce Arnold System of Ear Training, then Contextual Ear Training is an indispensable companion course that we cannot recommend highly enough. Contextual Ear Training is usually done with its sister course Ear Training One Note Complete. The combination of both courses gives a student a listening and singing regimen of exercises that will totally transform your ability to hear music. These two courses have been used by thousands of musicians to transform their ear training skills. Both courses are not based on interval training or the distance between notes but upon the sound of each pitch within a key center. Through the consist use of these exercises you will memorize the sound of all 12 pitches within a key center. If you are having troubles along the way Mr. Arnold gives free and unlimited email support to customers that purchase his books. There is also an extensive FAQ build into this website and well as multiple blogs where Mr. Arnold talks about many music subjects. You are not out on your own once you start this ear training process and you are encouraged to check in and check in often to make sure you are not doing any of the exercises incorrectly. We are often asked which is better for doing the ear training exercises the physical book with CDs or the Digital Downloads. If you have a smart phone like an iPhone or a tablet that will play MP3s then the digital download should be your preferred choice. MP3s can be played on your desktop computer or any MP3 player like a cell phone. This allows you to do these exercises anywhere which is important. One of the first things Mr. Arnold recommends is doing these exercises multiple times a day and what better device to use that a portable phone. Got 5 minutes at the office as you wait for client. Listen to 5 or 6 examples. This type of approach will have you improving at a remarkable rate. Check in with Mr. Arnold after purchase and tell him about your everyday schedule and he will work with you to design the best approach. Digital downloads give you more options so that is what we highly recommend in most instances. If you are trying to sing each note as it flows by in music, there is no way that you can calculate the distance between each note even at a very slow tempo much less the usual speed that notes flow by in real time. The only way to instantly know what notes are being played is to ingrain in your mind the sound of each note within a key center so that you know the sounds you are singing in the same way that you see the color blue and know it’s blue. The exercises found in this course are similar to the 1st assignment in the Fanatic’s Guide to Ear Training and Sight Singing. The main difference is you can do the exercises found in Contextual Ear Training anywhere that you can listen to an MP3 player, which is just about anywhere, whereas the exercises in the Fanatic’s Guide require you have your instrument on hand to check your answer. There are two versions of the Contextual Ear Training: The version found on this page uses a piano to play the key center and also to give the answer. Contextual Ear Training Voice Edition uses voices to form the key center and gives you the answer with either a Tenor, Alto or Soprano sung voice. For many students who struggle with ear training, the Voice Edition can be easier, particularly if you choose an edition that is close to your own vocal range, so keep that in mind. Buy Contextual Ear Training and then contact Mr. Arnold with a detailed explanation of your level and goals. This entry was posted in Ear Training and tagged bruce arnold, ear training lessons online, contextual ear training, ear training one note complete, aural comprehension, aural skills, good ear, ear trainer, ear training tools, big ears, ear mastery, ear training exercise, ear training tutor, ear training, jazz, instruction, bruce arnold system by Muse Eek. Bookmark the permalink.